The Zogoflex Air Dash Frisbee Dandelion Dog Toy has an aerodynamic design that’s easy for parents to throw and fun for dogs to fetch. The durable outer shell surrounds a soft foam material, so it won’t hurt your pup’s mouth or your hands, and the center hole allows for smooth, off the ground pickups, a stable, fast flight and a gradual descent. This Frisbee is injected with Air Technology, making it a high-flying dog toy that’s fun to fetch on land or in water. This was a difficult product to review. First of all the dad in the family was afraid to let Blue Belle give it a try. The Air Dash Frisbee seems soft enough for her to catch, but it seems very heavy. He was worried that it would hit her in the head and hurt her. Finally I was able to give it a try. Blue Belle loves to catch a ball and her soft bite floppy disc, but didn’t know what to do with this heavy frisbee. I started by telling her it was a frisbee. I threw the Air Dash Frisbee into the yard several times and she just let it go and didn’t even go after it. I showed it to her again and told her to pick it up and bring it to me. She finally understood that it was something she could play with. Success – she caught it and brought it back. But she doesn’t really play with it, because she loves her pink floppy disc flyer. The Zogoflex Air Dash Frisbee by West Paw is very sturdy and all of their claims do appear to be true. Our dog, Blue Belle, an Ausie/Blue Healer, prefers a light-weight flyer. Rescue Dog, Blue Belle, is happy to feature her video review of the toy we received from Chewy.com. We are playing inside today because the fires in Washington, Oregon, California, and Idaho are bringing smoke into our beautiful sky. Not too much fun playing outside in the bad air. Blue Belle loved playing with the Kong Squeezz Rope toy. The toy has a soft handle, which is perfect for dog lovers to play with their pooch. There is a soft squeeker ball on one end and a durable rope ties it all together. The Kong Squeezz Rope toy works well as a toss toy, tug toy, and a toy for retrieving. The toy comes in a variety of colors. We received a blue toy, our favorite color. Blue Belle loves this Kong toy. We recommend it. Blue Belle, the Canine Dog Blogger reviews the Odin, a geometric puzzle dog toy. The Odin is a dog toy designed to look great in your home, while being a full featured puzzle toy. You place dog treats into the toy and then your dog tries to get the treats out by playing with the toy. It gives dogs the mental and physical stimulation they need and stays interesting to any dog who loves food. 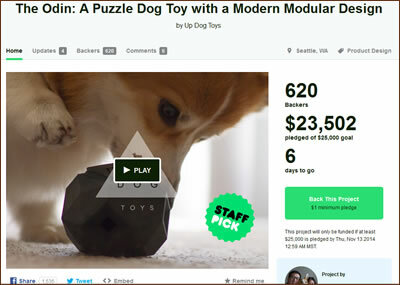 The Odin was a kickstarter campaign reviewed by our dog blog. Discount for our Readers: Our readers can take 10% discount before 8/30/15 with the code DOGBLOG10. Modern, geometric design looks great in any home and stands out from other dog toys. Geometric shape also makes the toy more fun and enjoyable because it prevents the toy from rolling around excessively and causes the toy to bounce unpredictably when thrown. Male and female interlocking pieces allow The Odin to be chained together to offer more challenge and versatility. We plan to create new toys to attach to it as well. Tough and large enough to not be swallowed by big dogs but light enough that small dogs can roll it around. Dishwasher safe, non-toxic and phthalate free. Four differently sized holes to allow treats of varying sizes to fall out. Smaller treats come out easier, while larger treats increase the challenge for skilled dogs. Flaps to allow treats to be easily placed inside without falling out. Flaps also are a way for dogs to try to lick the treats instead of rolling or tossing the toy to get treats out. We received two of the toys. Blue Belle was so excited to see that the treats we placed inside the toys can easily drop out as she rolls the Odin around with her paw and nose. We do recommend this toy. We will let Blue Belle tell the rest of the story. Just a reminder to our DogBlog visitors, The Odin campaign is almost funded, but they need a little help. With just 6 days left they still need a few more dollars to reach their goal on KickStarter. Let’s help this cool toy make it to the finish line. We are pleased to tell our readers about the launch of a Kickstarter campaign for an innovative new toy for your dogs. The Odin is a toy that engages your dog physically and cognitively, challenging your dog’s brain to earn a treat. The modular design allows for multiple Odin toys to be attached, reshaping the toy and providing an even more challenging experience. The Odin is dishwasher friendly and constructed with tough non-toxic materials. ” Dogs don’t care how their toys look, they just want to play. So why not make a beautiful dog toy, something that complements your home? With this in mind and other ideas on improving our dog’s favorite toys, we created The Odin, a puzzle treat toy that is beautiful for your home and fun for your dog. The Odin is a dog toy designed to look great in your home, while being a full featured puzzle toy. A puzzle toy is a dog toy where the owner puts dog treats into the toy and then the dog tries to get the treats out by playing with the toy. It gives dogs both the mental and physical stimulation they need and stays interesting to any dog who loves food. Check out this amazing dog toy Kickstarter Campaign. Let’s back this Kickstarter campaign because it’s a fun puzzle toy for your dog and a great design, and we think it is AWESOME!